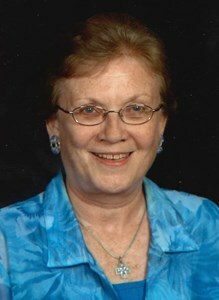 Newcomer Family Obituaries - Ellynne I. 'Elly' Doenecke 1943 - 2019 - Newcomer Cremations, Funerals & Receptions. Ellynne I. Doenecke, age 75, of Toledo, passed away March 7, 2019 at Hospice of Northwest Ohio Toledo. She was born April 29, 1943 in Lima, OH to James and Madlynne (Fetzer) Stinehelfer. Elly is survived by her sons, Timothy (Annette) Doenecke, Mark (Sue) Doenecke and Matt (Corri) Doenecke; grandchildren Madeline, Tyler, Ben, Jonathan, William and Landon Doenecke; brother, Jeffrey (Chris Pletcher) Stinehelfer and sister-in-law, Debbie Stinehelfer; and a host of nieces and nephews. In addition to her parents, Elly was preceded in death by her husband, Charles “Chuck” Doenecke; and brother, James Stinehelfer, Jr.
A Memorial Service will be held Saturday morning time TBD, May 25, 2019 at Sylvania United Church of Christ. Memorial contributions may be made to American Cancer Society or Mercy Health Foundation Marguerite d’Youville in Elly's memory. To leave a special message for Elly's family, please click on the share memories tab above. Add your memories to the guest book of Ellynne Doenecke. Please accept my deepest condolence. May you take comfort from Gods promise to reunite us with our loved ones by means of the resurrection. John 5:28,29. Elly was a neighbor to Irene Nieble and I for a number of years at Georgetown Apartments in Fort Wayne, IN. We enjoyed our time and friendship with her. Our sympathies are with her family as we know she will be missed. She was special to us, too. "To be absent from the body is to be present with the Lord". "Precious in the sight of the Lord is the death of His saints". May our risen Lord Jesus richly bless you all now and in the days ahead as you remember Ellyne's life and her home going to Heaven. Now and in the days ahead, may Jesus our God of comfort hold you all in the palm of His hand as you remember and celebrate Elly's life legacy. peacewithGod.net Her memory will live on in the hearts of all who knew her. Elly was on our church staff at Simpson United Methodist Church in Fort Wayne, Indiana. She had a positive spirit and a heart of gold for ministries to neighborhood children. She is not forgotten. God bless her soul and her family! I was so blessed to call you my mother-in-law. I am so grateful that you raised the most caring sons and I was lucky enough to marry your ray-of-sunshine. You lived a life serving others with a grateful heart and have instilled that philosophy with your children. My own boys (or the dynamic duo as you called them) will miss your weekly “thought of the week” inspirational quotes but will try to live them daily. Even though we will miss you, we will always remember your spirit and joy for life- no matter the circumstances. We love you to the moon and back! You were a very inspiring person to me! Thank you for coming to my sporting events! You lived a great life! Love you! Rest In Peace with papa! Elly (Nana) will always have a special place in my heart. She would take me to school every day. I really got to know her and I’m glad I did. I love her so much and will never forget her. Love you so much Nana. You were an inspiration to me and so many people. Rest In Peace.